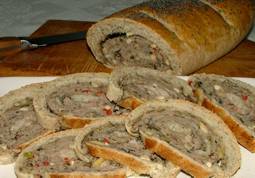 Galganov's Recipe for Deli Meat on Rye Loaf! Don't have a dough hook? Click Here for Instructions Without a Dough Hook. In your bowl, put your 3/4 Cup warm water. Sprinkle 1 3/4 Teaspoon active, dry yeast into the water and let sit for three minutes. Add 1 Teaspoon oil, 1 1/2 Teaspoon Salt, 1 Teaspoon Sugar, 3 Tablespoons minced/crushed basil and mix well. Add 1/2 Cup Rye flour and beat until smooth. Add 1 Cup white, all purpose flour (or bread flour) and beat until smooth. We do additions at low speed to avoid kicking up dust. We think dough "likes to be abused" a little so we speed it up to high for short bursts - a few times in the kneading process - to break the rythm. Add another 3/4 cup all-purpose flour and knead, on low, until all the flour is absorbed. If you need a little more, add 1/4 Cup (or less) of all purpose flour at atime just until the stickyness is gone - kneading it just until it's smooth and consistent throughout. We find we need to remove the ball from the dough hook and leave it in the bowl - giving it a chance to start over and smoothen the dough ball. Free the dough from the hook and shape it into a flat, oval ball. Then take about 1/2 Teaspoon of oil in your hand and rub it all over all sides of the ball of dough and return the slightly oily mass to the mixing bowl (this will keep the dough from drying while it rises). Let it rest while you remove excess oil from your hands. Then cover the bowl with a lid (plastic, towel, etc - we use a metal lid) and let it rise in a warm, draft-free place (we use the oven with the oven light on - no heat - just the oven light) for 70 minutes or until the dough has doubled in bulk. Mix together by hand. It doesn't need to be turned into pulp, just stired until all the ingredients are even spread through the mixture. When dough has risen, take it from the bowl and press it by hand - pushing the bubbles out of the dough - to a rectangle of about 10" x 15" (25 cm x 40 cm) and let it rest under a tea towl for about 5 minutes. Roll the rectangle out to about 14" x 20" (35 cm x 50 cm). It will be in the area of 1/4" (.6 cm) thick. Lay down your meat mixtures with about 1 1/2" (4 cm) bare around 3 sides and a trailer of dough about 5" (10 cm) or more long. The meat will be spread out at about the same thickness as the dough. Roll it up toward that long tail at the other end - pinching off the ends, and then pinching a tight seam once the trailing piece of dough is rolled up. Put it on a greased tray, seam down, to rise for 40 minutes. We put it in the oven with the oven light on (no heat - just the oven light) - covered with a piece of wax or parchment paper. We find parchment sticks less. Optionally, sprinkle a few poppy seeds across the top of the loaf for that authentic, deli look and taste. When the oven is hot put the baking sheet on the middle shelf in your oven for about 25 minutes to 1/2 hour. If, at 1/2 hour your dough seems done on the top but the bottom is soft this is a good time to use your hot pizza stone. 5 minutes OR LESS will seal that crust nicely. Be aware - every oven is different. If you find the bottom doesn't cook fast enough and you don't have a good way to finish it (ie, a pizza stone) be sure not to use multiple pans. Use a single pan only. Tap test for doneness - leaks can cause serious burns! This Deli Meat On Rye Loaf is the result of having tried a "stove-pipe stuffed mushroom". We had mushroom stuffing left over and decided to try it baked into a loaf of bread. 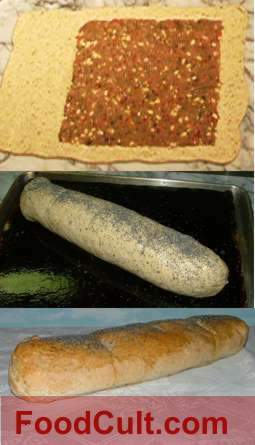 We mixed it with a bit more stuff and rolled it into a loaf. It was quite interesting ... very good! It cut up like a fun party loaf and we thought it deserved a bit of development time so we re-made it and remade it until we thought it a nice, stable recipe which will deliver a dependable, fun to eat treat. This Deli Meat on Rye Loaf is made on a deli-style light rye bread made savory by adding basil to the dough. The meat should be lean since so much flavour will come from the addition of fresh vegetables. Additionally, the dough ismade with very little oil (1 tsp oil + 1/2 teaspoon to coat for rising). The meat ends up having a texture a bit like a paté. It sits fully cooked into a delightful, very light rye bread. Cut and layed, in slices, on a plate; this loaf is an exciting and fun party food. One might say, "What we've baked, here, is a cold cut sandwich on rye ... 'the complete deli rye'." This recipe introduces a variety of flavours. It takes a bit of time to prepare but we think it's a fun, new treat to put on the party table or simply as a snack on an active day. It's a delight warm but it's a perfect, cold snack. With a bit of a creative bent, this can be turned into a vegetarian loaf (and maybe we'll do that one day). This recipe has several steps and we'll present them, here, in order. As with most of our recipes, this one requires no special equipment, however, a dough hook (a mixer with an attachement to knead the dough) would be nice.